I grew up eating Quorn, my parents followed the slimming world diet and Quorn was a great option for ‘Green’ days, as they were called back then. None of us were vegetarian at the time, but we all enjoyed eating it regardless, so when I turned vegetarian 10 years ago obviously Quorn remained a firm favourite of mine over any other meat-substitute on the market and that’s because Quorn is soy-free – I have an under-active thyroid and scientists claim that soy can be detrimental to the thyroid gland, so while I do eat some soy products I do try to limit it and thanks to Quorn products, that is a lot easier when I need a high protein meal. Over the last decade Quorn have come a long way, their products have expanded largely and they now offer a vast range of different vegetarian products and in some countries even vegan. This a huge breakthrough for vegetarianism as we now have the option to eat, not only burgers or sausages. But also, chicken style pieces, mince, chicken style fillets, deli-style meats for sandwiches and these Quorn Mozzarella and Pesto Escalope’s – to name only a few – all of which are made from a good quality protein. Lately, I have also seen Quorn being offered on the menu at pubs/restaurants too, which wasn’t an option 10 years ago and means we, as vegetarians can now eat out with our families and enjoy a meal like a normal person without having to munch on a dodgy salad, in the corner, like a rabbit. So, when I found these Quorn Mozzarella & Pesto Escalope’s at Asda on the weekend I was over the moon, as it is usually really hard to find different types of Quorn around my area. But, I was lucky enough to order them online and have them delivered on Sunday. It has been a few years since I last had a Quorn escalope so when first cutting in to it; I was expecting a gooey, river of mozzarella and pesto sauce to flow out– almost like a Kiev – But I was left sadly disappointed and the mozzarella and pesto escalope didn’t have the strongest of flavours either; I could definitely taste the mozzarella and to my surprise the escalope actually had stringy mozzarella instead of a sauce which I wasn’t expecting. But, the addition of actual mozzarella rather than a sauce was a bonus for me because as most know, I’m a huge cheese lover. The pesto however; was very mild in flavour and only seemed to have a hint of basil flavouring. 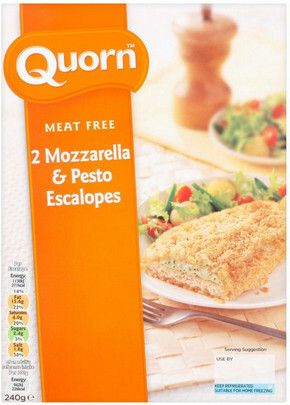 Was I disappointed with the Quorn Mozzarella & Pesto Escalope’s? Maybe slightly. I love my food to have strong flavour, so when I bite into it I get a good punch in the face with the flavourings and this certainly didn’t do that for me, instead I was left searching for the pesto flavour. That doesn’t mean I didn’t enjoy the escalope because I did; I liked how thick the escalope was: from its flat shape you would assume it to be flimsy and thin, but it was actually a decent thickness and didn’t feel like you were chewing on cardboard like most meat-free brands I have tried. Would I Buy the Quorn Mozzarella & Pesto Escalope’s Again? I still have one more escalope to eat, as they come in a pack of 2 and I do plan to eat it without any sauces which may deter the flavour from the escalope, but at the minute I probably wouldn’t pay full price for these again £2.85 or 3 for £5 at Asda. However, if I came across these half price then it is likely. I wasn’t completely displeased with these escalopes, I still enjoyed them and I knew I was getting in a decent amount of protein -10g and fibre – 5g with my meal without the additional nasty soya. Quorn could probably be a little more heavy handed with the amount of filling inside the escalope and also have a better Quorn to filling ratio. But like most things, there is always room for improvement and not all products are going to please everyone. I think I would go middle of the road here and say 5. As I didn’t hate the product, but I also didn’t love it like other Quorn products I have tried. And that concludes my review for the Quorn Mozzarella & Pesto Escalope. I will be reviewing the Quorn Meat Free Ravioli later on in the week so stay tuned for that. Also, if there are any other Quorn products which you want me to review, then just comment below.